There are more (toaster oven, microwave, George Foreman "grill", waffle iron), but I use the following tools all the time. To be clear: I don't like spending money on tools when I don't [think I] have to. In the case of the impending Gaggia Classic delivery, I realized I had to spend money to get what I want... but still couldn't resist cheaping out and ordering a refurbished unit! Cuisinart DLC-7 Pro 14 cup, 6A food processor ($50 on craigslist). This is a serious work horse of an appliance. Farberware Convection/Broil Oven ($40 from a coworker) cooks a 1 hour recipe in 45 minutes, and browns more reliably than my (rented) apartment's oven... or any oven I've used. 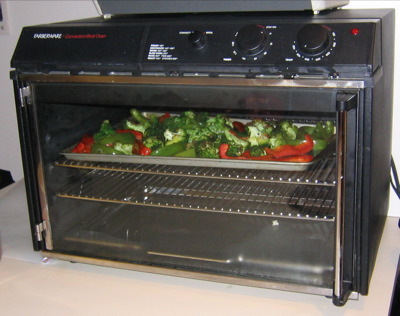 Great design-- since the controls are on top, the oven cavity is big enough for a standard cookie sheet. Everybody should have one of these. Gaggia Classic espresso machine ($360 refurbished from Whole Latte Love) rocks my world! 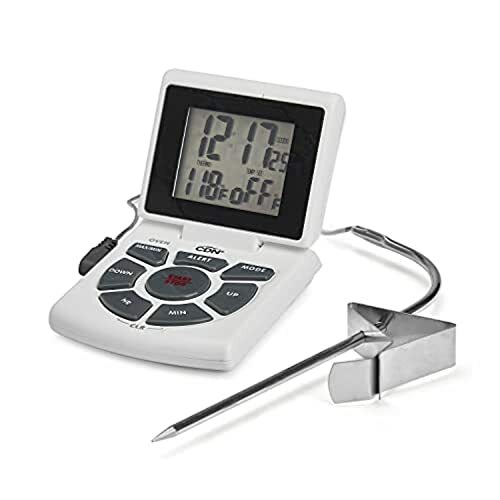 CDN digital thermometer/timer ($25 from Home Chef) is useful every day. EZ-Cook butane canister gas stove ($12 at Kamei) gets the job done with reliable flame control. Braun immersion blender ($8 from Ross), a no-nonsense, fixed blade thingie that does the trick. Juice King JK-50 juicer... ok, not a power tool, but it has a big lever and looks awesome ($FREE: found on the street in the Mission). Still like the Classic most? I did too, but got the Rancilio Sivlia and then got an "open box" livia (pasquini) from JL Hufford, and the pasquini, BY FAR, is the best. Of course... it's like twice times as much too!